The Pekingese (also known as the Lion-Dog due to their resemblance to Chinese guardian lions) received their name from the ancient city of Peking, which is now called Beijing. They were considered sacred dogs, regarded as a legendary Foo Dog that drove away spirits and could only be owned by Chinese royalty who favored them as both a lap dog and companion dog. These dogs were seen as semi-divine and people without noble rank had to bow to them, if a dog were to be stolen the person was put to death. When an emperor died, his Pekingese was sacrificed so that the dog could go with him to give protection in the afterlife. In 1860 the British overtook the Chinese Imperial Palace. The Emperor Xianfeng had fled with all of his court to Chengde but before doing so he ordered the Chinese Imperial Guards to kill the little dogs to prevent them from falling into the hands of the "foreign devils". However, an elderly aunt of the emperor remained. When the troops entered, she committed suicide and was found with her five Pekingese mourning her death. They were removed and brought back to England and it is from these five dogs that the modern day Pekingese descended. The Pekingese is a small, well-balanced, compact dog. It has a stocky, muscular body that is slightly longer than it is tall with a heavy front and lighter hindquarters. Their wide flat heads have dark, slightly prominent (but not bulging) eyes, flat faces, dark wrinkled muzzles and hanging, heart-shaped ears. The tail is high-set and carried over the back and the legs are noticeably bowed restricting their movement - it is thought that this rolling gait may have been deliberately developed by breeding to prevent the court dogs from wandering in ancient times. They have a long, thick (especially around the neck) double coat - the outer coat is long and coarse in texture with profuse feathering while the undercoat is soft and thick - that can come in any colors except pure white or liver. Pekingese is a very brave little dog, cute, lovable, spunky, proud, protective, jealous, sensitive, independent and extremely affectionate with its master. They are dignified, bold and have a great self-esteem - truly “lion-like” in the way they look and how they carry themselves. They may be small dogs but are not to be considered delicate or dainty; they are hardier than their reputation lets on, and they don't mind going out for a romp in the rain. These little dogs are relatively inactive and don't need much space to be happy, they can live contentedly in an apartment or a mansion. They make ideal companions for singles, seniors, apartment or couch potatoes but not for active people as they will rather sit on the couch than run around outside. These are indoor dogs, they are prone to having heatstroke if they are left outside or exposed to high temperature. This breed makes good watchdogs, they are distrusting of strangers and will bark at unusual noises as well as almost anything else. They love to bark and bark and bark, proper training and socialization can temper this a little… but not that much. 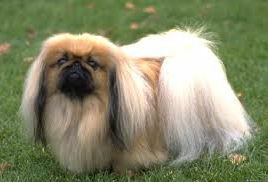 The Pekingese are not active dogs, they have low exercise needs and won’t hassle you for a walk every evening. However they do enjoys walks and a daily walk will keep them slim, healthy as well as mentally and physically fit. Play will also take care of a lot of their exercise needs, and they enjoy a good romp in a safe, open area off lead - such as a large, fenced-in yard. Just be careful when they exercise that they don't overheat; because of the shape of their nose they cannot handle extreme temperatures. Like a lot of small breeds the Pekingese is prone to developing Small Dog Syndrome, this is where the dog believes that they are boss and is due to the fact that the owner is too lenient with them and lets them get away with more that they should because they are so small and cute. This can lead to behavioural problems including being obstinate, self-willed, jealous, separation anxiety, guarding, growling, snapping, biting, and obsessive barking. To prevent this you need to give this dog rules, and limits to what they are and are not allowed to do; be firm and consistent. They were bred as lap and companion dog. They are affectionate and sensitive creatures and in spite of their self-important air they need plenty of attention. If they don’t get all the attention they need they have the tendency to become jealous and will compete for attention. Like other small dogs, Pekingese have “big dog” personalities - brave to a fault. To show dominance they will pick on much bigger dogs or refuse food, games and other offerings; they can also become protective of their owner to the point of being possessive, training and a firm hand is very important to prevent this behaviour. Your Pekingese will love to show off and will prance around trying to impress you, they can entertain themselves for hours with a toy and take pride in being your favorite companion. However, they do snore, snort, sneeze and snuffle. Which other breeds are most compatible with the Pekingese? Because Pekingese are fearless and won’t think twice about taking on a dog twice its size, getting a large dog with a challenging/dominant nature (like a Pitbull, Staffie, German Sheperd, etc) can only lead to disaster. A better choice will be a small breed dog that is not to challenging like a Maltese, Miniature/Toy Poodle, Shih Tzu (just make sure you can give both enough attention), another Pekingese (of course), Pomeranian, etc. If you are looking for a bigger dog it is best to get a calmer, easy-going breed to prevent any challenges between them. Look at breeds like a Gray Hound, Great Dane, Labrador (once they calm down after their boisterous teen years), Wolfhound, Saint Bernard, etc. It is important to keep in mind that these dogs are fearless, brave and courageous and think they are far larger than they really are. If they feel that another dog is a threat they will not think twice about taking them on - no matter what the size of the other dog. They can become dog aggressive to the point of foolhardiness. Some Pekingese do well with children, others do not - it greatly depends on the individual dog. However, they generally do better with older children that know how to handle them. Because of the dog’s small size toddlers may handle them like toys and they will stand up for themselves if rough-handled - leading to a bite. Because they are stubborn and opinionated Pekingese are very difficult to train (especially to house train), they learn new commands slower than most other breeds. You will need a lot of patient to train them; but with consistency, a firm hand and positive reinforcement techniques it is very possible. Keeping the Pekingese coat healthy and presentable requires daily brushing, this will also help keep you house free from hair as they are heavy shedders. Those that are not interested in showing their dogs can keep them in a pet-cut which is less maintenance that the show-cut. They will also need trip to the groomer every 8-12 weeks depending on the cut. Other important grooming aspects include too clean dirt from their eyes, face wrinkles and ears to prevent infections. Also because they are not very active they don’t naturally wear their nails down, so they need to be trimmed when necessary. As you groom, check for sores, rashes, or signs of infection such as redness, tenderness, or inflammation. Your careful weekly exam will help you spot potential health problems early. Trichaiasis (lashes growing inwards toward the eyeballs). o Dr. Heuston established smallpox vaccination clinics in China and in gratitude, the Chinese minister - Li Hongzhang - presented him with a pair of Pekingese which he named Chang and Lady Li. Dr. Heuston founded the Greystones kennel. There are a couple of stories about the origin of the Pekingese. o One says a lion and a marmoset fell in love. But the lion was too large. The lion went to the Buddha and told him of his woes. The Buddha allowed the lion to shrink down to the size of the marmoset. And the Pekngese was the result. o A second says a lion fell in love with a butterfly. But the butterfly and lion knew the difference in size was too much to overcome. Together they went to see the Buddha, who allowed their size to meet in the middle. From this, the Pekingese came. o Another legend says that the breed resulted from the mating of a lion and a monkey, getting its nobleness and coat from the former and its ungainly walk from the latter. Leave them outside where they are exposed to high/low temperatures. Due to their abundance of fur and flat faces they struggle to regulate their body temperature.